Providing you the best range of microprocessor based digital disintegration apparatus with effective & timely delivery. Microprocessor Disintegration Test Apparatus Model -LT-8000 is a solid state instrument designed for the accurate estimation of disintegration time of tablets as per IP/USP standards. The instrument is designed to test two batches of six tablets, simultaneously, and useful for pharmaceutical industry. It is used in quality control labs and R & D to determine compliance with the disintegration requirement of the tablet and capsule as per USP/IP standards. Instrument uses the latest microprocessor technology and advanced engineering techniques so as to give enhanced accuracy and reproducibility. The system has user friendly prompts, which guide you throughout the measurement process. Microprocessor Disintegration Test Apparatus is equipped with 4 line alphanumeric LCD display with backlit for displaying various test parameters and 15 soft touch membrane type keys with full numeric keypad that provides a convenient interface for entering numeric values. The samples being analyzed are automatically stored in the memory in different batch and sample numbers. The instrument has the storage facility for 200 samples. It also has the facility for 20 different test setups which are retained in the memory even when the system is switched OFF. Provision has also been made for attachment of any dot matrix printer with centronics interface so that any of the stored setups/result can be printed. 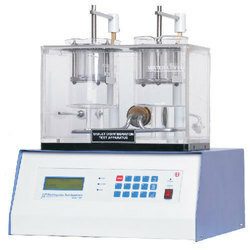 The unit is provided with two glass beakers having capacity of 1000 cc. with arrangement to hold temperature sensor placed in the sturdy, acrylic water bath. The large spread out stainless steel heater ensures perfectly uniform heating. The instrument has dual channel temperature system with sensors to monitor the test temperature of disintegration beaker as well as water bath temperature. The temperature of the water bath and beaker is accurately maintained at Â± 0.2 oC. The basket speed is accurately controlled and maintained as USP, IP specifications.